Appearance: like a pelican mixed with an eel. All white glass and teeth, tiny wings along the flanks of its snake-like body. Each round, the Blizzard Eel can perform any or all of the following attacks. 1. Gulp and Charge. Moves 20 this round instead of 16. Charges an isolated target and attempts to swallow them whole. Requires an attack roll. If successful, the target takes 1d6+3 damage and is swallowed. 2. Churn. Creatures that are swallowed take 1d6 piercing damage per round while trapped in the creature's knife-lined guts. They can crawl to the creature's mouth with a successful Strength test. Any melee attacks against the Blizzard Eel while swallowed gain a +4 Attack bonus, but two-handed weapons, bows, etc. cannot be used. If there are no isolated targets, the blizzard eel will circle, using the storm as concealment. It will not target anyone in full plate armour (it dislikes metal) or anyone who looks pointy or spiny. It will vomit out anything poisonous, and for convenience's sake, the snow will negate any fall damage. 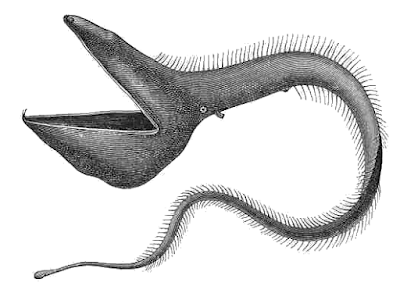 The eel will eat up to 6 humanoids or horses. It's big. Really big. It flies by magic and it's skin is like leather. The blizzard itself blocks vision past 10, but in bursts you might be able to see up to 30'. The eel will pick a dense swirl of wind and attack from concealment. The last thing you'll see is a huge tooth-lined mouth and two tiny black eyes. It's like being hit by a hungry bus. The blizzard eel is the first encounter of the Steam Hill dungeon. It is not designed to be fought. It's designed to make the players run away. It won't attack them on the stone stairs up to the dungeon, so all they need to is stick together and move as fast as they can towards the stairs. The eel will eat their guide (unless the party somehow convinces their guide to stick close to the group, in which case a Scald Zombie will get him during the night). The DM should actively encourage the party to run instead of fight. If they do fight though, the eel is designed not to slaughter them immediately, and to give them a chance to survive for one or two tense rounds.